1. In the Source sub-tab of the SVN tab you can find the URL for the SVN repository to checkout. Note: if you are having issues with a caret (^) in your URL, replace each caret with "%5E"
We recommend using TortoiseSVN as a Subversion client for Windows. Precondition: Make sure you have an Assembla password. If you signed up with your Google or Yahoo account, you might need to create an assembla password. To set one, just go to your profile page and create a password. Step 1: Create a folder in your local file system. Right click inside the folder where you want to checkout the repository and select "SVN Checkout..." from the pop-up menu. Step 2: In the new pop-up window, enter the URL for your Assembla-hosted SVN repository and click OK. 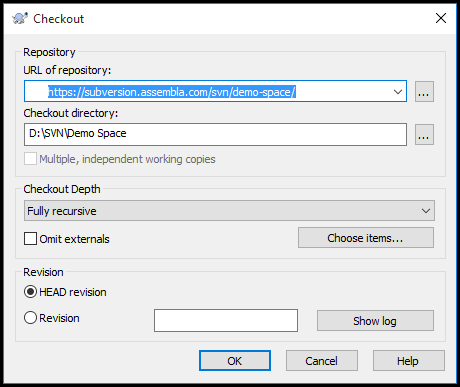 The URL can be copied from the SVN repository Source tab on Assembla. Step 3: When prompted, enter your Assembla username and password and hit Enter to checkout the repository. Step 3: Checkout the repository. $ svn commit -m "Commit Message"
If you currently organize your project files in an unversioned directory structure, then they must be added to your Assembla SVN repo before you can start committing your changes to those files. If you're using TortoiseSVN as your client, simply drag the files into your repository structure (whether it's empty or not), Then right-click and select TortoiseSVN and Add to convert your file into a versioned file as a part of your SVN repository. If you are using a command line client on your Mac, simply drag the files (and directories, if applicable) into your repository structure (whether it's empty or not) and then use the "svn add" command to convert your file or directory into a versioned file as a part of your SVN repository. Then, simply commit the changes to your repository as usual.